WILL I BE ABLE TO ENTER ABGT250 AT ANYTIME? As long as you have a ticket in hand that has not been scanned you will be able to enter the event from the moment it opens until the time the event ends each day. 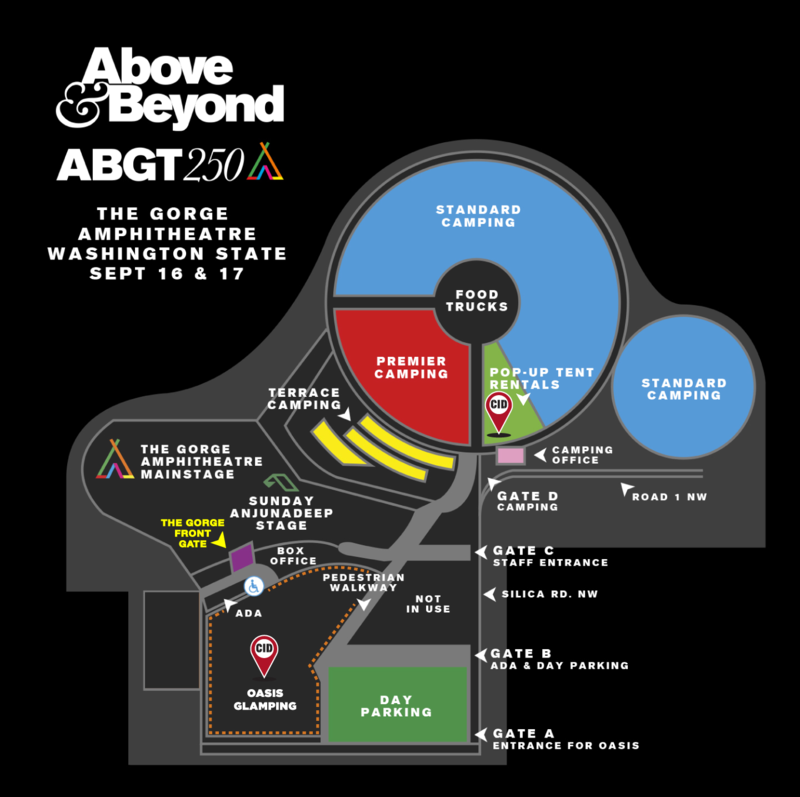 WHAT TIME DOES ABGT250 START & END? Box office hours will be 1:00PM – 10:00PM on Saturday, September 16th. CAN I ENTER, LEAVE AND RE-ENTER ABGT250? Unfortunately due to the the format of this event and some unfortunate licensing restrictions, we cannot allow reentry to the event for anyone. Once you are in you are in, so bring everything you need for the day. Email contact@anjunabeats.com with details about your outlet. We’ll read all requests - if we don’t get back to you, unfortunately your request has been denied. CAN I PASS OUT FLYERS AT THE FESTIVAL? Unless they’re flyers promoting Duncan & Gareth From The Office’s next gig, no. Yes, magical money machines will be on site. Smart campers will bring cash in advance to avoid queues. The cost of parking is already included in your ticket price. There is no additional charge to park in the on-site lots unless you choose the Star Parking Upgrade, available via Live Nation. Unfortunately, there is no overnight parking - please see the camping sections for information on overnight camping. Is there a site map of the venue? You can bring in one 20oz factory sealed bottle of water. There will also be bottled water sold inside the venue, as well as complimentary water stations in select locations. OTHER THAN A 20OZ FACTORY SEALED BOTTLE OF WATER, CAN I BRING IN A CAMELBAK OR ANY OTHER WATER CONTAINERS? You may bring in water containers (including camel-baks), provided that they are empty as you enter the festival. They will be inspected. WHAT CAN BE IN MY 1-GALLON BAG OF SNACKS? You can bring 1 Ziploc bag no be larger than 1 gallon and all snacks inside must be factory sealed. You may bring your small non-professional still camera. (No removable lenses) Video cameras (including Go-Pros) are not allowed inside the venue. If the festival does not sell out in advance, tickets will be available at the box office at a higher price on show date. Do not buy tickets from ticket scalpers. Also be aware of regular scalpers. Your scalp belongs on your head! WILL THE GENERAL ADMISSION TICKETS BE A WRISTBAND, A LANYARD OR TICKETS? General admission will have a ticket. No wristband or lanyard will be issued for GA tickets. VIP people get a shiny lanyard (which may not actually be that shiny, it will definitely be nice though). CAN YOU REPRINT LOST AND MISPLACED TICKETS AT THE GORGE AMPHITHEATRE BOX OFFICE? ARE TICKET PRICES GOING TO INCREASE FROM WHERE THEY ARE NOW? Yes, for the best price tickets you MUST sign-up for the April 13 pre-sale via Ticketmaster Verified Fan ABGT250.com. General on-sale tickets will go up in price allotted amounts are sold. TL;DR - avoid tiers / tears, register for the pre-sale now. IF I BUY FROM AN AUTHORIZED RETAIL LOCATION, WILL I GET A PHYSICAL TICKET THAT WILL GAIN ME ADMITTANCE? Yes. Retail locations sell tickets, which will be valid for entry. CAN I ATTEND THE EVENT IF I AM UNDER THE AGE OF 18 AND I COME WITH A LEGAL GUARDIAN? This event is strictly 18 and older. Security will not allow anyone under the age of 18 into the venue. MY ID WAS LOST/STOLEN. WHAT CAN I USE TO PROVE THAT I AM AT LEAST 18 YEARS OLD? If you have a passport, security will accept all government issued passports. Expired government issued identification will only be accepted WITH temporary DMV documentation that is valid and proves you are going to receive a new valid ID. Please review a more detailed description of the ID rules here. Please bring your expired ID AND your temporary DMV documentation that proves your ID is being renewed. Review all the detailed ID rules here. Security will not accept consular identification or a foreign government issued drivers license (Canadian drivers licenses or identification cards that are not expired may be used to grant entry into the festival). They will accept any foreign government issued passport provided it has a photo, name and date of birth on it. A passport can be acquired by scheduling an appointment with your local consulate office. Security will not accept consular identification or a foreign government issued drivers license other than Canadian Province issued driver’s license or identification card. US military ID, Merchant Marine ID, Tribal ID (not all accepted), and US Possessions issued ID will all also be accepted. They will accept any foreign government issued passport provided it has a photo, name and date of birth on it. For more detailed camping info, please visit the Camping Page of this site. ARE THERE SHOWERS – HOW MUCH DO THEY COST? Hot & cold showers are available. For Regular camping the showers can be found at the “Pivot” and there will be a $3.00 charge. In Premier and Terrace Camping showers are provided free of charge. WILL STANDARD CAMPING SELL OUT? No and passes will be available to purchase at the gates but we recommend getting your passes in advance so your entry is easier. ARE THERE SUPPOSED TO BE BRACELETS THAT COME WITH THE CAMPING PASSES IN THE MAIL? CAN I UPGRADE MY CAMPING PASS? There are no camping upgrades. As long as you are of age, alcohol is permitted within the confines of your individual campsite, but no open containers or alcohol consumption is allowed in the public areas or on the roads. CAN I BUY 2 CAMPING PASSES WITH ONE CAR AND HAVE A BIGGER SITE? Sure – just make sure you show the campground attendant both passes upon arrival. IS THERE A LIMIT ON TENT SIZE AT THE GORGE? HOW BIG ARE THE CAMPSITES FOR GENERAL CAMPING? A general/standard camping site is about 15’x25′. Enough room for one vehicle and tent. CAN I HAVE MORE THAN ONE TENT IN OUR CAMPING SPACE ALONG WITH OUT VEHICLE? Clothing for all temperatures – the nights can be chilly. You can bring your own food for the campground. A bit of patience, give our staff a wave and a hello instead of a snarl, they are working very long hours and really hard to make these shows happen, but expect occasional lines, it happens when thousands descend on one place at one time. No. Do not bring any pet whatsoever, not because we don’t like them – we are all animal lovers here – but it is cruel and unfair to the pet to leave it alone in the campground or parking lot, locked up or in a car or tent where it may suffer from extreme heat. When we see a pet in a car or running around the campground unattended, we will alert the authorities and your vehicle may be entered and the pet taken to a shelter for its own welfare. You may be subject to prosecution for cruelty to animals. Service Animals are permitted. CAN PEOPLE COME TO AND FROM THE GORGE? Not encouraged – especially during busy ingress period – but provision can be made – you would need to get a reentry pass from Guest Services on the way out of the campground. WILL THERE BE A PLACE TO PARK VEHICLES FOR THOSE SHARING CAMPING WITH OTHER PEOPLE? No – if you want to park a vehicle overnight you will need a camping pass for that vehicle – one vehicle = one camping space. The Gorge parking area does not allow overnight parking. CAN I VISIT OTHER CAMPING AREAS WITH MY CAMPING PASS? Terrance pass holders can visit any camping area. Do these packages have a minimum age? For the hotel travel packages, all persons must be at least 18 years of age to purchase a travel package and check-in (*except Comfort Suites Moses Lake – purchasers must be 21+). Persons under the age of 18 years (21 for Comfort Suites) may still occupy a room, however the person whose name is booked for the reservation must be 18 years of age to check in (21 for Comfort Suites). Please be sure to bring valid photo dentification and credit card. For the home rentals, all persons must be at least 25 years of age to purchase a home rental and check-in. Persons under the age of 25 years may still occupy the house, however the person whose name is booked for the reservation must be 25 years of age to check in. Please be sure to bring valid photo identification and credit card. Do the travel packages, home rentals and tent rentals include tickets? All travel packages include (2) two-day tickets for the event. Based on availability, you will have the option to choose between GA tickets or VIP tickets with your travel package. All home rentals include (4) or (6) two-day Tier 2 VIP tickets for the event. Tent rentals do not include tickets to the show. Tickets need to be purchased separately in order to access the tent rentals. How will I receive my tickets and merchandise? A CID representative will be available at the hotel to assist all travel package guests. Here you will pick up your tickets and merchandise. As the event gets closer, the package purchaser will receive an email with all of the event details including times and locations for check-in. Please be sure to bring a valid photo ID and credit card. Home rental and tent rental purchasers should stay tuned for the informational email to provide specific check-in instructions! Can I acquire Accessible Seating as part of these packages? If you would like to inquire about Accessible Seating as part of a package, please reach out to CID Entertainment at guestservices@cidentertainment.com or 888-805-8930. Check-In time for the home rentals is 5PM and Check-Out is at 10AM. Is there anything else I should know about the home rentals? No smoking or pets are allowed at the home rentals. All home rentals require a credit card authorization of $750 security deposit to cover any damages. Your deposit will be returned upon check out with no sign of damage to the property. What is the best way to get to the shows? If you purchased a hotel travel package or home rental, there is round-trip transportation from your hotel or home to the Gorge and back included in your package! CID Entertainment is also offering one-way or roundtrip shuttle transportation from Seattle-Tacoma Airport to The Gorge or Travel Package Hotels. I want to stay longer! Can I extend my stay at the hotel? Based on availability, you will be given the option to add an additional night on Friday, September 15 th onto your order during the purchase process. If you would like to extend past that night, please contact the hotel directly to inquire about booking an additional night. Please be sure to book the same room and bed type as your package. Once the new reservation is made, please contact CID Guest Services team at 888-805-8930 or guestservices@cidentertainment.com. While they cannot make any guarantees, we will certainly do our best to link the reservations so you don’t have to switch rooms! Is parking provided at the hotel? All of the travel package hotels offer free parking for hotel guests! How will I receive information regarding my shuttle passes? You will receive a detailed informational email from CID Entertainment about one week prior to the event date with specific shuttle information. The people attending the concert with me may be arriving late. How would they get their tickets, merchandise, etc.? The original purchaser will pick up everyone’s tickets and merchandise. They will have to distribute accordingly. I purchased packages for a friend or family member, but I will not be in attendance. How can they pick up their tickets on my behalf? In order to accommodate this, the original purchaser must contact CID Entertainment’s Guest Services team at 888-805-8930 or guestservices@cidentertainment.com to authorize an alternate pick-up person at least 2 weeks before the event date. This authorization will allow a friend or family member to pick-up the package on the purchaser’s behalf. All informational emails and correspondence will still go to the original purchaser and it is up to them to relay the information to the guest that is attending the event. Can I use my CID package for a contest/giveaway or to promote my website/product/event? No. CID Entertainment’s trademarks, intellectual property, tickets and other offerings may NOT be used for advertising, promotions, auctions, contests, sweepstakes or any commercial purpose, without express written consent from CID and its partners. Please see our purchase policy for more detail. All packages are non-refundable. Please refer to CID Entertainment’s Purchase Policy for complete details. Are there terms and conditions for Home Rentals? Yes there are, more details can be found here here.